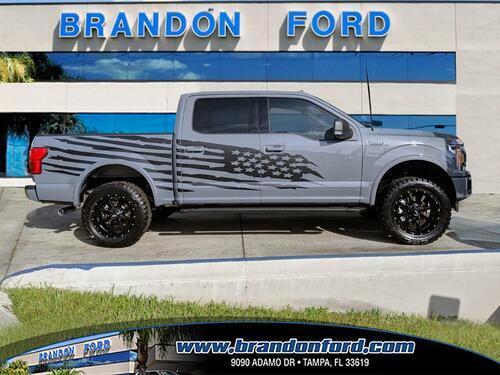 Brandon Ford not only offers the best selection of Ford vehicles, we also offer custom work for your car or truck. We perform all custom work on-site, whether it is a truck lift, custom wheels, leather installs, body kits, suspension upgrades, super-charger installs, exhaust packages, or stripe kits. Brandon Ford has the parts to give your vehicle that "one-of-a-kind" look! Here are a few vehicles currently in our inventory with that Brandon Ford touch! 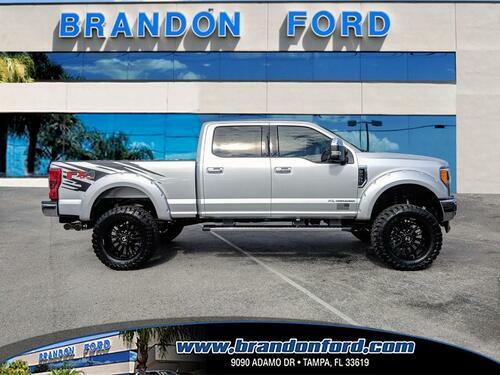 BF Custom - 6'' Lift - Lariat Ultimate Package - Tow Technology Bundle - Twin Panel Sunroof. 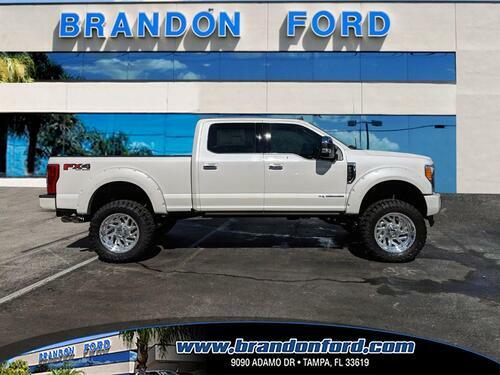 This vehicle has been equipped with a back up camera, reverse parking assist system, high capacity trailer tow package, chrome running boards, a keyless entry keypad, and 22'' wheels. Interior options include premium leather seating, climate controlled seats, a touch screen radio, adaptive cruise control, and a leather wrapped steering wheel with mounted controls. BF Custom - 6" Lift - Platinum Ultimate Package - Twin Panel Sunroof. This vehicle has been equipped with a back up camera, reverse parking assist system, a keyless entry keypad, intelligent access entry, and a high capacity trailer tow package. Interior options include premium leather seating, climate controlled front seats, a touch screen radio, power adjustable pedals, Sirius satellite radio capability, and a leather wrapped steering wheel with mounted controls. 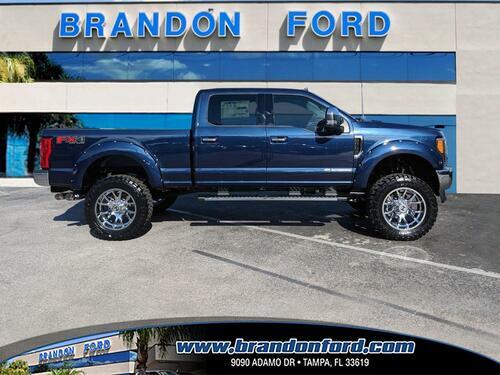 BF Custom - 6'' Lift - Lariat Ultimate Package - Navigation - Twin Panel Sunroof - Tow Technology Bundle. This vehicle has been equipped with a high capacity trailer tow package, a back up camera, reverse parking assist system, chrome running boards, and a keyless entry keypad. Interior options include premium leather seating, climate controlled front seats, a touch screen radio, adaptive cruise control, B&O play premium audio system, and a leather wrapped steering wheel with mounted controls. BF Custom - 6" Lift - Platium Ultimate Package - Twin Panel Sunroof - Navigation. 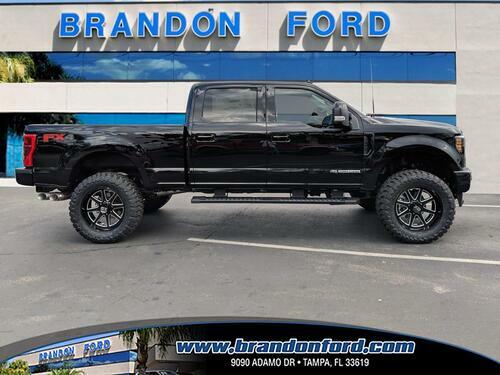 This vehicle has been equipped with a back up camera, reverse parking assist system, intelligent access entry, American Force wheels, Toyo Open Country Tires, and a keyless entry keypad. Interior options include premium leather seating, climate controlled front seats, a touch screen radio, B&O play premium sound system, a voice activated sync system, Ford Pass Connect, and a leather wrapped steering wheel with mounted controls. 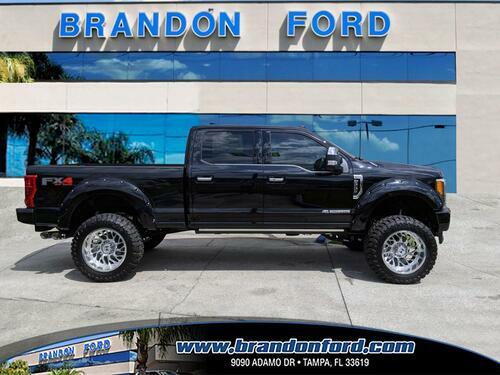 BF Custom - 3.5" Level - Lariat Sport Package - Ultimate Package - Navigation - Twin Panel Sunroof. This vehicle has been equipped with a tow technology bundle, 5th wheel prep package, back up camera, reverse parking assist system, a keyless entry keypad, and a spray in bedliner. Interior options include premium leather seating, climate controlled front seats, B&O play premium sound system, touch screen radio, Ford Pass connect 4G modem, a voice activated sync system, and a leather wrapped steering wheel with mounted controls. BF Custom - 2.5" Level - Navigation - 2.7L EcoBoost Engine. This vehicle has been equipped with a trailer tow package, pro-trailer back up assist system, back up camera, remote start system, and a keyless entry keypad. Interior options include premium cloth seating, a voice activated sync system, Sirius satellite radio capability, a touch screen radio, Ford Pass Connect, and steering wheel mounted controls. BF Custom - 2.5" Level - 3.5L EcoBoost Engine - Navigation. This vehicle has been equipped with a back up camera, remote start system, max trailer tow package, 36 gallon extended range fuel tank, a keyless entry keypad, and integrated blind spot monitoring system. Interior options include premium cloth seating, a touch screen radio, voice activated sync system, pro-trailer back up assist system, pre-collision assist, and steering wheel mounted controls.